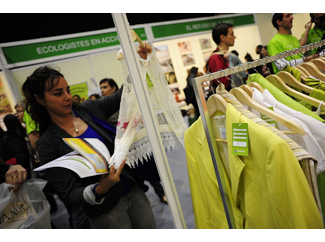 Biocultura, Organic Products and Responsible Consumption Fair, held in Barcelona, ? 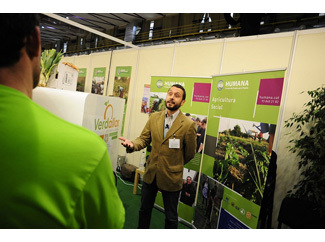 ?was the venue chosen by Humana to present the initiatives identified in the 2013 edition of its social farming program. Humana drives in Catalonia since last year sustainable agricultural models between organizations also play a social good because they specialize in organic or because they work in the area of ??exclusion. SEO-Birdlife (Amposta, Tarragona). “Arrosvolució-000” El canvi que vols veure project. Ayuntamiento de L'Ametlla del Vallès(Barcelona). 'L’hort escolar, context i Comunitat' project. Ayuntamiento de Valls (Alt Camp). Proyecto 'Hort per a la inclusió social'. Verdallar (Barcelona). 'Verdallar, Ecological Vision' project. Taller Jeroni de Moragas (San Cugat, Barcelona). 'Capacitació laboral per persones en risc d’exclusio social en l’àmbit de la producció agrícola' project. Associació Xicòria (Montblanc, Tarragona). 'Desenvolupament comunitari als horts Socials de Montblanc' project. Fundació Privada Onyar-La Selva. 'Reconversió del centre especial de treball ONYAR vers l’agricultura i l’alimentació ecològica i l’aprofitament energètic de la biomassa forestal' project. Associació d’Amics del Jardí Botànic de Barcelona. 'Sembren Il•lusió. Un viver de producció a l’hort del jardí botànic històric de Barcelona' project. Around 70,000 people, according to the organization, visited Biocultura during the four days of the fair. Many of them went through Humana booth to learn more about work being carried out around cooperation, development education, social farming, textile recycling and sustainable fashion. Visitors were interested in the fate of the clothing worn, the countries that are carried out cooperation programs, the location of the containers of clothing and footwear, or the type of clothing that can be purchased in Humana stores. Also showed interest in the actions that promote awareness and the Human Day. The large audience showed great sensitivity to environmental issues and the process of recovery of the clothes. The show has proven to be an excellent showcase for initiatives that are taking place in the realm of sustainable bio, which is textile recycling important piece. It is, also, an event in which the good atmosphere, solidarity and environmental protection are mixed in equal parts. On Friday 26 Humana organized the workshop "The textile recycling, recycled fashion and development cooperation", which highlighted the virtues of sustainable fashion and respect for the environment. Also addressed the impact of textile production in our environment, considering that it is estimated that a person buys about 16 kg of textiles annually. 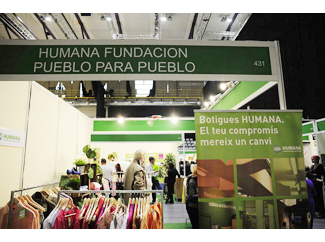 Humana manages the textile used and subjected to a recovery process that obtains the resources that make possible the development of cooperation programs and social assistance.